Paris High School and Paris Junior High School choir students had the privilege of working with esteemed conductors at the All Region Choir clinic and concert. 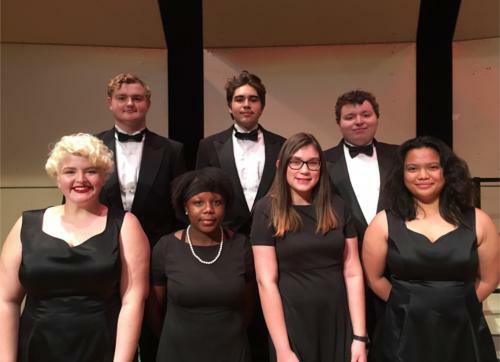 Paris High students Rowan Burns, Rhea Tabora, Jared Posey, Nick Leija II and Nicholas Reed worked with clinician and conductor Lane Parks who was trained by one of the most esteemed choral conductors of all time, Robert Shaw. Paris Junior High students Nyla Rollerson and Kayglen Shelton worked with Texas composer Laura Farnell as their clinician and conductor. They had the special privilege of performing one of her compositions. Paris Junior High School student Alexis Jackson made the Junior High Treble Region Choir but was unable to attend the clinic and concert. Paris High School choir director, Jan Blize and Paris Junior High School choir director, Lindsay McCarter are proud of their students’ efforts that earned them a chair in this year’s region choirs and hope this experience will be one they will treasure for many years to come. Nick Leija II, and Nicholas Reed.